Following on from the last episode, we carry onto the next round. My posts are in blue, Marks are in green, and any post-editing commentary are in red. The gladiator rules used are Munera Sine Missione - note that this version may have differences to the current version. Each round will be posted as a weekly episode. These were great fights, especially that of Mago’s, the crowd was right in it. Macer has noticed that Kemsa is doing it really easy and starting to think he has a prodigy on his hands! Noctua was angry that his plan to beat Mago backfired. He approached Macer with an offer to buy Mago for 50 gold, seeing his potential, but Macer took this as an insult. Noctua walked away saying “We will see….”. Mago gains a new skill but Kemsa does not, as he beat a lower ranked opponent. Their winnings were Mago: 6 gold, Kemsa: 3 gold. Their savings are now: Mago: 21 gold, Kemsa: 7 gold. Onto world news. 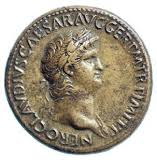 Apart from stripping the provinces of resources, the Emperor Nero is mass minting new smaller coins to fund the rebuilding of Rome. This has lead to a debasement of the currency, increasing inflation and placing every economy on the brink of collapse. It has also increased the frequency and severity of riots throughout the Empire. To simulate the effects of rampant inflation, the debt owed to Macer for freedom has now risen from 100 gold to 120 gold. Mago had suffered some heavy wounding from his fight, and is unable to participate in training. One of the household servants helping to heal him is Dahia. Both Mago and Dahia grew close, and, as it transpired, Dahia soon fell pregnant. Upon finding out, Macer was not impressed. “Another mouth to feed? Have you not seen the prices for turnips* lately? All turnips are being sent to Rome, and the extortionate prices charged to us locals for the leftover scraps is criminal!” The end result is that, after each fight, Mago will from now on have to pay 1 gold to Macer as an ongoing upkeep cost. To find an additional revenue source in these trying times, Macer has decided to charge for “private” cestus fights between his gladiators. He figures that wounding from the cestus is less severe, and fights will likely finish by exhaustion instead. The first paying customer has been found, a rich merchant from Rome passing through town arranging turnip and wine deals. As is the custom in these private fights, the paying merchant chooses the fighters, and all the gladiators lined up (except for Mago who is still wounded). The merchant chose Isaac, a newer recruit of Macer’s from the province of Judea, and Kemsa. Treat the cestus as a normal weapon except when attacking, roll a d4 instead of a d6. (defender still rolls d6, all other rolls are still d6). a “double 1” event signifies cestus strapping coming loose. The gladiator needs to spend 2AP to correct, or they are limited to just one attack each turn. Gladiators cannot use any skills gained in arena fights (each has zero skill level). Let me know the outcome. There is no appeal to the crowd, the loser will survive, unless brought to -4 or less strength, which is unlikely. Or so Macer thinks. * Turnips are a very important staple food in the province of Africa. Kemsa had a bit of sparring practice with other gladiators in Macer's ludus, but he went into the fight with Isaac feeling quite nervous. It was his first Caestus fight, Isaac was a specialist at this genre, and it was also the first time Kemsa had been in a small private arena right under the noses of toffs who could make or break him by clicking their fingers. He need not have worried. Most of the small crowd invited to watch this private bout knew Kemsa was a rising star and were eager to see him at work. And because Isaac was from Judea there were also many shouted jokes ridiculing the Jews and their One God. Isaac was cautious at first so Kemsa closed in, but Isaac easily dodged the blow and Kemsa took a fatigue. Then quick as a flash Isaac worked around to Kemsa's right side and delivered a stinging blow, 1 strength lost. 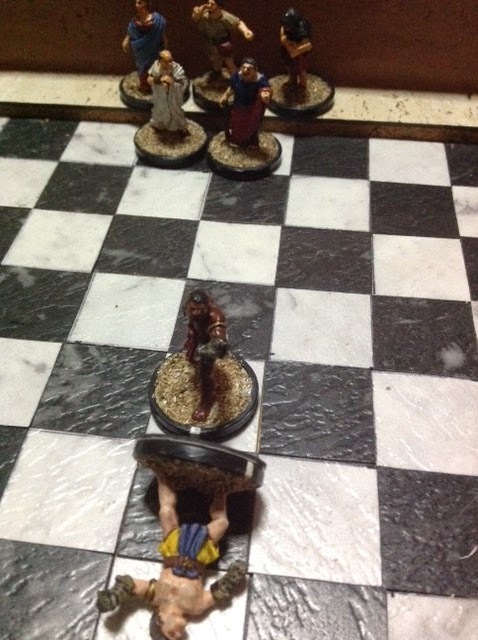 But Kemsa shrugged off the blow, turned quickly, and slugged Isaac to the ground. Kemsa then stood over the prone figure and delivered a second blow (other fist, disadvantaged weapon) and Isaac suffered another knock down while already down (two successive 'double 4' results), thus losing the bout. Uproar among the spectators! Macer's faction applauded a decisive win. Some booed and yelled about foul play, hitting a man while he was down. Photo below. The Editor (the rich merchant from Rome) was out of his depth, with both sides looking to him for a decision, and much unhappiness and possibly personal danger whatever he decided! It looked as if he might be pelted with his own turnips. This was not what he had paid for. In the end he played it safe, and ruled the fight had accidentally come to a premature end and should be started again. On the restart Kemsa was feeling a bit weak (not getting enough turnips perhaps?) but Isaac was also shaky, doubtless concussed after two knock downs. This is also a reflection of the Strength scores, Kemsa had 9 strength, Isaac had only 6. Anyway ... Isaac again avoided contact at first but in the small arena there is not too far to run. Kemsa was able to close and delivered a single blow ... and Isaac took a decisive knock down (double 2) with Kemsa obviously adjacent. I don't think I have ever seen three successive special event results in three combats before, all of them "defender knocked down". The crowd was not happy and demanded Isaac be killed on the spot. His adjusted appeal dice roll score was 0. Assistants carried Isaac off (he was out cold) as fast as possible before things got really ugly. I don't think this will hurt Kemsa's reputation with Macer as his new prodigy! I hope Kemsa does not start to get too big for his boots. In the past I've tended to scatter game reports over various forums, but now think its better to start using a blog so everything is in the one spot. I usually game at the Sutherland Shire Gamers on Friday nights. Can the Sellswords make it to the castle?